Happy Birthday to my girl Emily. Today she is turning the ripe old age of 8. She and I have been looking at a lot of fun cake pictures on Flickr the past few weeks. We have a tradition in our family when it comes to birthdays. The birthday kid gets to choose what kind (shape, color, flavor, design) of cake they would like and I try and make their wish come true. “Try” is the key word here. One year Emily wanted an elegant layer cake with PURPLE chocolate dipped strawberries surrounding it. Let me just disclose to any of you wanting to dye white chocolate chips purple…don’t do it with regular food coloring. The result was a drab elephant grey folks! Yep. Elephant gray! This year I let Emily choose a cupcake design and a cake design. We will be spending part of her birthday at Bear Lake with a lot of fun loving family members. We made these cupcakes earlier this week and are planning to take them with us to share with a whole herd of cousins. And when I say herd, I mean it. I’m planning to make the cake she chose to celebrate her upcoming baptismal day. Hold onto your hats everyone. It’s a doosy. I promise to post the result, just as long as it doesn’t turn out elephant gray. 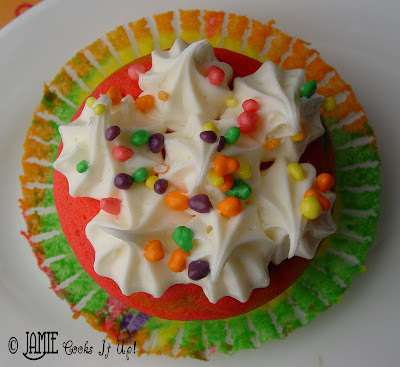 For today I have these fun Rainbow Cupcakes for you. I have seen pictures of these fun filled delights all over the Internet lately. And it’s not a wonder! They were a lot of fun to make and are so cheerful looking! It’s not too late to make a batch for your Easter picnic! ***NOTE: Wilton Brand Gel is sold at any craft store, or at Walmart on the cake decorating isle usually found near the craft section. Betty Crocker also sales food coloring gel. It’s found on the baking aisle with all of the bday candles, cupcake holders and what not. You will have a hard time getting very bright colors if you use regular food coloring….just say no to elephant gray, I learned the hard way…. 1. Prepare the cake batter according to the directions on the box. Separate the batter into 5 bowl. Add the food coloring gel of your choice to each bow. I was trying to match the bright girly colors of the nerds candy. Yes, I am a nerd. Thanks for asking. 2. Line your muffin tins with cupcake holders. 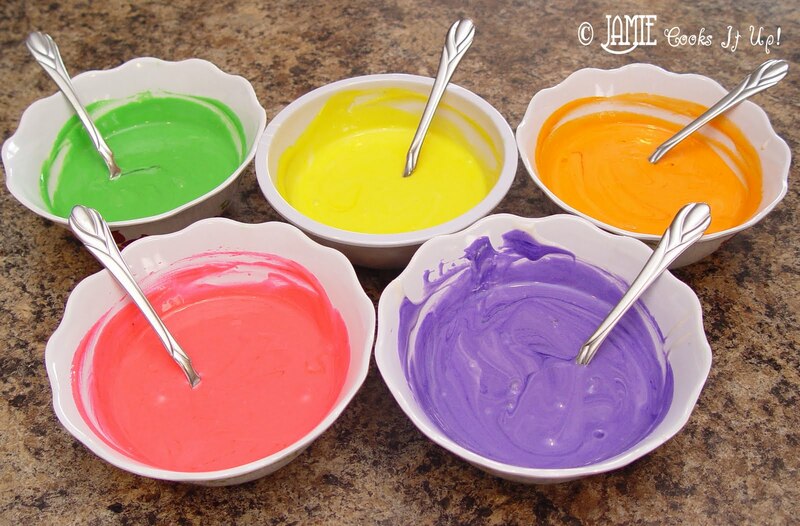 Pour a little bit of each batter color into all of your cups. Be careful not to fill them more than about 2/3 full. 3. Bake the cupcakes according to package directions. 4. Remove from the oven, pop them out of the muffin tins and let them cool their bright sunny selves on a wire rack. 5. 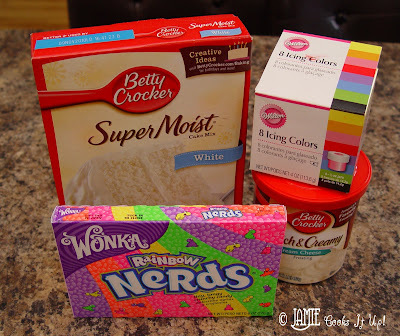 Pipe a bit (or a whole heck of a lot) of frosting onto the tops of the cooled cupcakes and sprinkle with the nerds. Don’t they look lovely! Not a bit of elephant gray in sight! And take a bite! Now there. That should make for a happy day. Until you remember all of those bowls you are going to have to wash……worth it. Very worth it! Happy Birthday, Em. You are one fine girl! Happy Birthday to your daughter Em! Perfect timing! I'm doing this with my playgroup today!! happy birthday Emily!!! I hope it is great and I hope you have fun at the lake!! 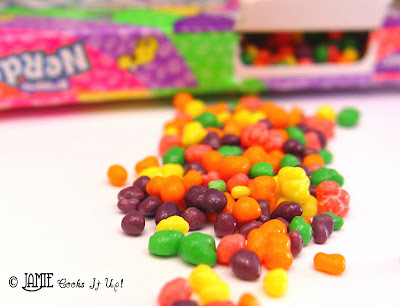 Topping these with nerds is such an awesome idea! Super cute!! These look so awesome! 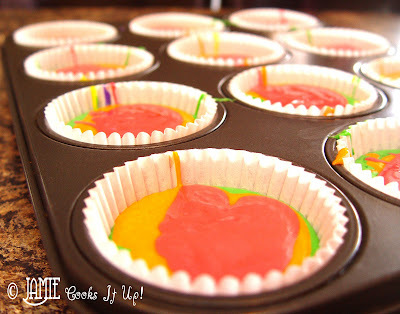 I am so making these for my son's birthday. Thanks! I let my little playgroup of three boys and Sarah (all four) make these cupcakes. They loved them. When my older kids got home from school that day they all marveled at the cupcake creations. I made enough to take them to my parents for our little Easter celebration. So fun to make and delicious too!! I love the nerd toppings, it gives it just the right punch, the kids and I had so much fun making and eating these!!! I saw your daughter at Jenna's Birthday Party and she asked me if you were a nerd in High School. I promptly said no, but I was. Then I read this. Ha Ha Ha. Oh well. I'm making these next week for teacher appreciation Week and out theme is “Teachers Color our World”. Thanks for the fun idea! Made some of these the other day, they were a huge hit and absolutely delicious! Made these for my daughters 4th birthday and everyone loved them and was asking me how I did it. Thank you for such a great idea! I will make these again! 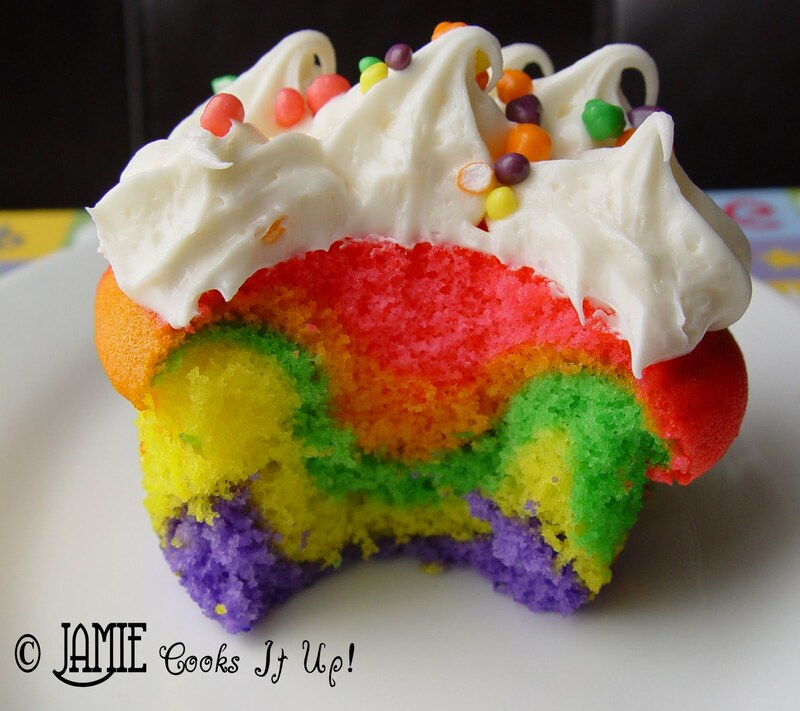 I have seen quite a few rainbow cupcake blogs lately, but think that your's is by far the most vibrant and fun! I really think that good food coloring is a must. 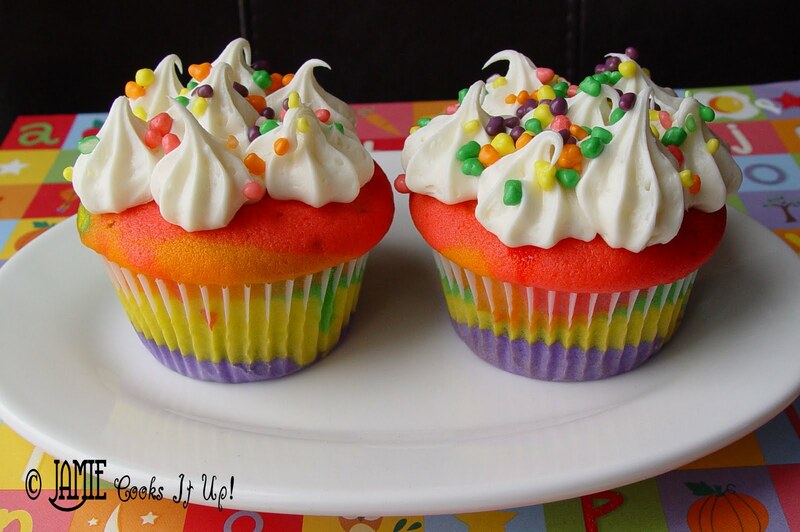 Now to just borrow someone's kid to make these for!! Hey we made these for our Mom and Daughter 60's party, they were a hit and just a yummie, thanks for the idea!